In 2011, there were 25.3 million Limited English Proficient (LEP) individuals, both foreign-born and U.S.-born, residing in the United States. Over the past 20 years, the LEP share of the total U.S. population has grown from close to 6 percent in 1990 to about 9 percent in 2011. The total number of LEP individuals has grown by 81 percent since 1990, and has established a relatively large presence in California, Texas, and New York. As a group, the LEP population in the United States is less educated and more likely to live below the federal poverty line than the overall U.S. population. LEP individuals are slightly more concentrated in the working ages and are comprised of a relatively small share of children. Employed LEP men in 2011 were more likely to work in construction, extraction, and transportation occupations than English-proficient men, while employed LEP women were more likely to work in service and personal care occupations than English-proficient women. Many immigrants in the United States come from non-English-speaking countries and thus are in various stages of English proficiency. However, not all immigrants are LEP. Of the total immigrant population in 2011, about half were LEP. Although most LEP individuals are foreign born, a sizable share (about 19 percent, or 4.8 million) of this population is native born. This article provides a demographic and socioeconomic profile of LEP individuals residing in the United States (ages 5 and older), including the population's size, geographic distribution, and demographic and socioeconomic characteristics. Data are from the U.S. Census Bureau's 2011 American Community Survey (ACS) and the 1990 and 2000 Decennial Census. In the American Community Survey, respondents who reported that they spoke a language other than English at home were asked to self-assess their English-speaking abilities with the options of "not at all," "not well," or "well," and "very well." As such, results are subjective and not based on English language tests. Only individuals ages 5 and older were surveyed about their self-reported English proficiency. Therefore, information about individuals who are LEP is restricted to the population of ages 5 and older. While most Spotlights focus uniquely on the foreign-born population, this article examines English proficiency for both the foreign-born and U.S.-born. The 25.3 million LEP individuals in the United States accounted for approximately 9 percent of the total U.S. population ages 5 and older in 2011. The number of LEP individuals in the United States has grown by 81 percent since 1990. About half of LEP individuals resided in three states: California, Texas, and New York. Nearly one in five residents in California was LEP. Approximately 94 percent of LEP individuals resided in metropolitan areas. LEP residents accounted for one-quarter or more of the total populations of seven cities in the United States, all in Texas and California. About 51 percent of LEP individuals were female. Nine percent of the LEP population was ages 5 to 15. Sixty-three percent of all LEP individuals were of Latino origin. LEP adults were less likely to have a college degree than English-proficient adults. In 2011, 75 percent of LEP men (ages 16 and older) were engaged in the civilian labor force. Thirty percent of employed LEP men worked in construction, extraction, and transportation, while nearly 40 percent of employed LEP women worked in service and personal care. 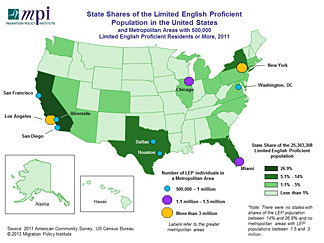 LEP individuals were more likely to live in poverty than English-proficient individuals. The term Limited English Proficient (LEP) refers to any person ages 5 and older who reported speaking English less than "very well" as classified by the U.S. Census Bureau. The term English proficient refers to people who reported speaking English only or "very well." The terms foreign born and immigrants refer to people residing in the United States at the time of the census who were not U.S. citizens at birth. The foreign-born population includes naturalized citizens, lawful permanent residents, refugees and asylees, authorized nonimmigrants (including those on student, work, or other temporary visas), and persons residing in the country without authorization. The term native born refers to people residing in the United States who were U.S. citizens in one of three categories: 1) people born in one of the 50 states or the District of Columbia; 2) people born in United States Insular Areas such as Puerto Rico or Guam; or 3) people who were born abroad to at least one U.S. citizen parent. The civilian labor force includes civilian persons ages 16 and older who were either employed or unemployed but in search of work in the week prior to participating in the Census Bureau's American Community Survey (ACS). Approximately 81 percent of the total LEP population was foreign born. About half of the foreign-born population (ages 5 and older) was LEP. The foreign born who were LEP were somewhat more likely to be recent immigrants than the total foreign-born population. Two-thirds of foreign-born LEP individuals were non-U.S. citizens. Spanish was the predominant language spoken by both foreign-born and native-born LEP individuals. Approximately 10.9 million children ages 5 to 17 resided in a household with at least one parent who was LEP. More than 74 percent of all LEP children ages 5 to 17 were native born. In 2011, approximately 21 percent (60.6 million) of individuals in the United States ages 5 and older spoke a language other than English at home. While the majority of those individuals spoke English with native fluency or "very well," about 42 percent (or 25.3 million) were considered LEP. Overall, LEP individuals represented 9 percent of the total U.S. population ages 5 and older. In addition to the 25.3 million LEP residents in the United States, 2.8 million LEP individuals resided in Puerto Rico. The number of LEP individuals in the United States has grown 81 percent since 1990. The LEP population grew from nearly 14 million in 1990 to about 25.3 million in 2011, representing an 81 percent increase. During the 1990s, the LEP population increased most dramatically (by 52 percent)—from nearly 14 million to about 21.3 million. During the 2000s, the rate of growth—although not insignificant—slowed to about 19 percent, increasing from 21.3 million to 25.2 million in 2010. In terms of share, while about 6 percent of the U.S. population was LEP in 1990, 8 percent was LEP in 2000 and 9 percent in 2011. Approximately 50 percent of LEP individuals lived in California (6.8 million), Texas (3.4 million), and New York (2.5 million) in 2011. In addition, large LEP populations resided in Florida (2.1 million), Illinois (1.2 million), and New Jersey (1.1 million). California's share of the total LEP population was by far the largest, making up about 27 percent of the nation's LEP population. Altogether, the top six states accounted for 67 percent of the nation's 25.3 million LEP individuals. While LEP individuals accounted for 9 percent of the total population nationwide (ages 5 and older), their share was equal or greater in ten states, including 19 percent in California, 15 percent in Texas, and 13 percent in New York, New Jersey, and Nevada (see Figure 1). Source: Authors' analysis of the U.S. Census Bureau's 2011 American Community Survey. With a total of 4.8 million native-born LEP individuals nationwide, the states with the largest native-born LEP populations were California (950,000 native-born LEP residents), Texas (930,000), and New York (450,000). Additional states whose native-born LEP populations were relatively small, yet made up a sizable share of their total LEP populations included Montana (57 percent of the state's total LEP population), West Virginia (49 percent), Maine (45 percent), New Mexico (38 percent), Alaska (37 percent), and North Dakota (36 percent). Of the 25.3 million LEP individuals in the United States in 2011, 23.8 million (94 percent) resided in core urban areas or surrounding counties. Major immigrant gateways in all regions of the United States had the highest populations of LEP residents, including greater New York (3.1 million), Los Angeles (3 million), Miami (1.3 million), and Chicago (1.1 million). Major metropolitan areas in Texas also had large LEP populations in 2011, including greater Houston (966,000) and Dallas (802,000). The metropolitan areas with the highest shares of LEP residents included Laredo, TX (130,000 LEP residents, or 56 percent of the city's total population); El Paso, TX (246,000, or 33 percent), greater McAllen, TX (234,000, or 32 percent); Salinas, CA (119,000, or 31 percent); El Centro, CA (48,000, or 29 percent); Brownsville, TX (108,000, or 29 percent); and greater Los Angeles (3 million, or 25 percent). While most of these areas did not have large numerical populations of LEP individuals relative to other metropolitan areas, the LEP population was substantial relative to the cities' overall populations. In 2011, the LEP population was about 49 percent male and 51 percent female, which is approximately equal to the gender distribution among the English-proficient population. In 2011, 9 percent (2.3 million) of LEP individuals were children between ages 5 and 15. By comparison, about 16 percent of the English-proficient population (or 43.1 million) was comprised of children between ages 5 and 15. The share of elderly LEP individuals was comparable to that of the English-proficient population, with about 14 percent in both groups. The share of working-age LEP individuals was slightly larger than that of the English-proficient population. Approximately 77 percent (19.5 million) of LEP individuals were between ages 16 and 64, versus 70 percent of the English-proficient population. About 63 percent of the LEP population was of Latino origin versus 37 percent of non-Latino origin. A breakdown of the non-Latino LEP population revealed that approximately 20 percent of the total LEP population was Asian, 13 percent was non-Latino white, and 3 percent was black. By comparison, Latinos made up 12 percent of the English-proficient population (see Figure 2). In 2011, about 14 percent (3 million) of LEP adults over age 25 had a bachelor's degree or higher, compared to 30 percent (56 million) of English-proficient adults. Almost half of all LEP adults (9.7 million) had less than a high school diploma. That share was significantly smaller among the English-proficient population, of which only 10 percent (19.3 million) had less than a high school diploma. Three-quarters of LEP men participated in the civilian labor force, compared to only half of LEP women. A gender-based breakdown of the English-proficient population was slightly more balanced, with 68 percent of men and 60 percent of women being engaged in the civilian labor force in 2011. The top three occupations for employed LEP men were construction, extraction, and transportation (2.3 million, or 30 percent of 7.6 million employed LEP men); service and personal care (1.8 million, or 24 percent); and manufacturing, installation, and repair (1.3 million, or 17 percent) (see Table 1). LEP men were more likely to work in construction, extraction, and transportation occupations than English-proficient men (30 percent versus 18 percent). LEP men were less likely to work in management, business, and finance jobs than English-proficient men (5 percent versus 16 percent). The top three occupations for employed LEP women were service and personal care (2 million, or 39 percent of 5.1 million employed LEP women); manufacturing, installation, and repair (617,000, or 12 percent); and administrative support (521,000, or 10 percent). LEP women were much more likely to work in service and personal care occupations than English-proficient women (39 percent versus 15 percent), and were less likely to work in administrative support than English-proficient women (10 percent versus 22 percent). In 2011, about 26 percent of LEP individuals lived in households with an annual income below the official federal poverty line, which is a substantially larger share than among the English proficient who lived in poverty (14 percent). Approximately 81 percent of the total LEP population were foreign born. In 2011, the majority (81 percent, or 20.4 million) of LEP individuals were foreign-born (see Table 2). The remaining 19 percent (4.8 million) of the LEP population was native-born; that is, these individuals were born in the United States or an outlying territory or were born in a foreign country to at least one U.S. citizen parent. 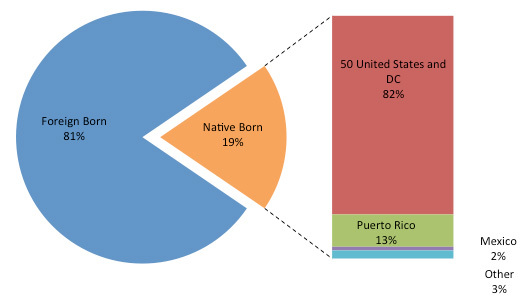 Of the native-born LEP population, about 82 percent were born in the 50 U.S. states and the District of Columbia, while 13 percent were born in Puerto Rico and 2 percent in Mexico (see Figure 3). Note: Mexico share of 2 percent includes people who were born in Mexico to at least one U.S. citizen parent. Other share of 3 percent includes people born in United States Insular Areas other than Puerto Rico (such as Guam), or people who were born abroad to at least one U.S. citizen parent. Out of approximately 40.2 million foreign-born individuals in the United States in 2011 (ages 5 and older), about 20.4 million (51 percent) were LEP. While approximately 31 percent (12.6 million) of all immigrants arrived in the United States after 2000, about 35 percent (7.1 million) of LEP immigrants arrived in the United States after 2000, representing 57 percent of all immigrants who arrived after 2000. At the other end of the spectrum, about 14 percent (2.9 million) of LEP immigrants arrived in the United States before 1980, representing 37 percent of all immigrants who arrived prior to 1980. Two-thirds of foreign-born LEP individuals were noncitizens. Of the foreign-born LEP population, 13.4 million (66 percent) were noncitizens. This is a larger share than the 55 percent share among the total foreign-born population. About 65 percent (16.4 million) of the LEP population (both foreign- and native-born) spoke Spanish, followed by Chinese (1.6 million, or 6.4 percent), Vietnamese (850,000, or 3.4 percent), and Korean (630,000, or 2.5 percent). There were marked differences in the top languages spoken by LEP persons by nativity (see Table 3). As shown in Table 3, 77 percent (3.7 million) of the native-born LEP population spoke Spanish, followed by German (153,000, or 3 percent), French (127,000, or 3 percent), and Chinese (108,000, or 2 percent). Spanish was also the predominant language among the foreign-born LEP population, representing about 62 percent (12.7 million) of the foreign-born LEP population. Other languages spoken by the foreign-born LEP population included Chinese (1.5 million, or 7 percent), Vietnamese (765,000, or 4 percent), and Hindi and related languages (622,000, or 3 percent). Note: Chinese includes Chinese, Mandarin, and Cantonese; French includes French, Patois, French or Haitian Creole, and Cajun; German includes German and Pennsylvania Dutch. Out of the 73.8 million children ages 5 to 17 residing in the United States, approximately 10.9 million (15 percent) lived with at least one parent who was LEP. More than 74 percent of all LEP children between ages 5 and 17 were native born. Among the 2.6 million children between ages 5 and 17 who were LEP in 2011, more than 74 percent (1.9 million) were native born, versus nearly 26 percent (660,000) who were foreign born. About 72 percent of all native-born LEP children resided in households with at least one foreign-born parent. The majority (about 1.5 million, or 77 percent) of all native-born LEP children lived in Spanish-speaking households. Other languages spoken by native-born LEP children included Vietnamese, Chinese, and German (about 3 percent in each group). About 55 percent of all native-born LEP children were of Mexican origin; 4 percent were born in Puerto Rico (see Definitions box) or were of Puerto Rican origin; 3 percent were of Salvadoran origin; 8 percent were of other Hispanic origins; and 29 percent were of non-Hispanic origin. Overall, about 58 percent of all native-born LEP children resided in four states: California (487,000, or 25 percent), Texas (385,000 or 20 percent), New York (145,000, or 8 percent), and Florida (102,000, or 5 percent). The metropolitan areas with the largest populations of native-born LEP children included greater Los Angeles, (200,000 or 10 percent of all native-born LEP children), New York (156,000, or 8 percent), Houston (106,000, or 6 percent), Chicago (94,000 or 5 percent), and Dallas (85,000, or 4 percent). U.S. Census Bureau. 2011. 2011 American Community Survey (ACS), Table B06007, Place of Birth by Language Spoken at Home and Ability to Speak English in the United States. Available online. U.S. Census Bureau. 2011. 2011 American Community Survey (ACS), Table B016001, Language Spoken at Home by Ability to Speak English for the Population 5 Years and Over. Available online. U.S. Census Bureau 1990 Decennial Census Summary Tape File 3. Accessed from the Minnesota Population Center. National Historical Geographic Information System: Version 2.0. Minneapolis, MN: University of Minnesota 2011. Available online. U.S. Census Bureau 2000 Decennial Census Summary File 4. Accessed from the Minnesota Population Center. National Historical Geographic Information System: Version 2.0. Minneapolis, MN: University of Minnesota 2011. Available online. Monica Whatley is a Data Analyst at the Center for Workforce Studies at AAMC. Whatley was previously a Quantitative Research Intern at MPI.